The Incredible Shrinking Man is not big on dairy because it promotes excess growth in the body. But we’ll make an exception for the milk of the tiny Vechur cow originating from the warm and humid climate of the state of Kerala in southern India. According to the locals it’s the specific environmental conditions that keep the cows so small. And it is not just the Vechur. Kerala has a remarkably high number of small native Indian cows including the Vadakara Dwarf, Punganur cattle, the Kasaragod Dwarf and the High Range Dwarf. One might consider it a local farmer’s speciality, born from local necessity. 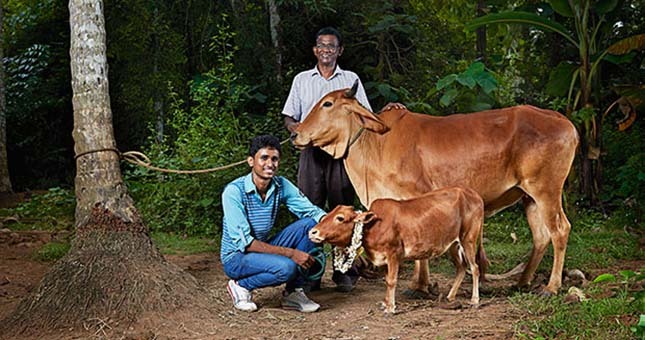 Small farmers in India do not always have the financial possibilities to maintain large cows. Smaller cows are less expensive to buy and maintain, a farmer with several small animals is less vulnerable to loss than a farmer with a single large animal, they give faster return on investment, and require cheaper facilities, among other things. The biggest thing least talked about is that these cows produce milk that does not, like regular cow milk, stimulate growth hormone production. In regular cow milk casein type A1 turns into caseomorphine, a substance known to stimulate the production of IGF-1 and growth hormone. Vector cow milk contains more casein A2 type, which is digested without turning into caseomorphine. It’s hard to imagine that man’s deeply embedded obsession with the idea that bigger is better almost killed these amazing animals. In 1961 local Indian policymakers confused by the paradigms of growth and innovation created the ‘Kerala Livestock Improvement Act‘ that gave livestock inspectors the power to castrate bulls of what they deemed ‘inferior’ cow breeds and to replace them with larger European crossbreeds. This flowed mainly from the idea that higher milk yields, regardless of costs and consequences, were all that mattered. Perhaps such practises and abundance fantasies were also related to the bovine deity Kamadhenu. Not surprisingly it came at considerable costs in terms of money for food, facilities and medicine to maintain health of the larger non-indigenous cows. For small farmers it became impossible to keep a cow, depriving their families of much needed protein and income. Most small Indian cow species were pushed to the brink of extinction. However, nowadays, in a reversal of fortune, the special and vital place for small cows is recognised and some small cow species are starting to thrive again. Perhaps they’ll turn out to be the preferred cows of our future, producing a milk without undesired growth effects, easier to keep and maintain, and cute.